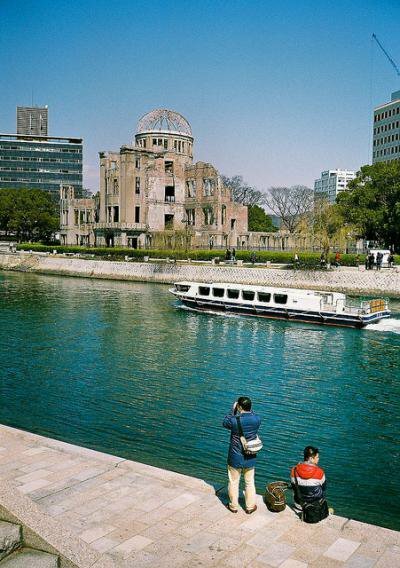 Has Genbaku Dome just become peace tourism? Flickr/Guwashi999. Some rights reserved. If some extraterrestrial species were compiling a history of Homo sapiens, they might well break their calendar into two eras: BNW (before nuclear weapons) and NWE (the nuclear weapons era). The latter era, of course, opened on August 6, 1945, the first day of the countdown to what may be the inglorious end of this strange species, which attained the intelligence to discover the effective means to destroy itself, but – so the evidence suggests – not the moral and intellectual capacity to control its worst instincts. Day one of the NWE was marked by the “success” of Little Boy, a simple atomic bomb. On day four, Nagasaki experienced the technological triumph of Fat Man, a more sophisticated design. Five days later came what the official Air Force history calls the “grand finale,” a 1,000-plane raid – no mean logistical achievement – attacking Japan’s cities and killing many thousands of people, with leaflets falling among the bombs reading “Japan has surrendered.” Truman announced that surrender before the last B-29 returned to its base. He termed the US strategic plan of 1960 that called for an automated all-out strike on the communist world “the single most absurd and irresponsible document I have ever reviewed in my life.” Its Soviet counterpart was probably even more insane. But it is important to bear in mind that there are competitors, not least among them the easy acceptance of extraordinary threats to survival. In the early days of the NWE, the US was overwhelmingly powerful and enjoyed remarkable security: it controlled the hemisphere, the Atlantic and Pacific oceans, and the opposite sides of those oceans as well. Long before World War II, it had already become by far the richest country in the world, with incomparable advantages. Its economy boomed during the war, while other industrial societies were devastated or severely weakened. By the opening of the new era, the US possessed about half of total world wealth and an even greater percentage of its manufacturing capacity. There was, however, a potential threat: intercontinental ballistic missiles with nuclear warheads. That threat was discussed in the standard scholarly study of nuclear policies, carried out with access to high-level sources – Danger and Survival: Choices About the Bomb in the First Fifty Years by McGeorge Bundy, national security adviser during the Kennedy and Johnson presidencies. Bundy wrote that “the timely development of ballistic missiles during the Eisenhower administration is one of the best achievements of those eight years. Yet it is well to begin with a recognition that both the United States and the Soviet Union might be in much less nuclear danger today if [those] missiles had never been developed.” He then added an instructive comment: “I am aware of no serious contemporary proposal, in or out of either government, that ballistic missiles should somehow be banned by agreement.” In short, there was apparently no thought of trying to prevent the sole serious threat to the US, the threat of utter destruction in a nuclear war with the Soviet Union. Reviewing recent research in Soviet archives, one of the most respected Cold War scholars, Melvyn Leffler, has observed that many scholars were surprised to discover “[Lavrenti] Beria – the sinister, brutal head of the [Russian] secret police – propos[ed] that the Kremlin offer the West a deal on the unification and neutralization of Germany,” agreeing “to sacrifice the East German communist regime to reduce East-West tensions” and improve internal political and economic conditions in Russia – opportunities that were squandered in favor of securing German participation in NATO. That conclusion was underscored repeatedly in the years that followed. When Nikita Khrushchev took control in Russia in 1953 after Stalin’s death, he recognized that the USSR could not compete militarily with the US, the richest and most powerful country in history, with incomparable advantages. If it ever hoped to escape its economic backwardness and the devastating effect of the last world war, it would need to reverse the arms race. Accordingly, Khrushchev proposed sharp mutual reductions in offensive weapons. The incoming Kennedy administration considered the offer and rejected it, instead turning to rapid military expansion, even though it was already far in the lead. The late Kenneth Waltz, supported by other strategic analysts with close connections to US intelligence, wrote then that the Kennedy administration “undertook the largest strategic and conventional peace-time military build-up the world has yet seen...even as Khrushchev was trying at once to carry through a major reduction in the conventional forces and to follow a strategy of minimum deterrence, and we did so even though the balance of strategic weapons greatly favored the United States.” Again, harming national security while enhancing state power. The Soviet reaction to the US build-up of those years was to place nuclear missiles in Cuba in October 1962 to try to redress the balance at least slightly. The move was also motivated in part by Kennedy’s terrorist campaign against Fidel Castro’s Cuba, which was scheduled to lead to invasion that very month, as Russia and Cuba may have known. The ensuing “missile crisis” was “the most dangerous moment in history,” in the words of historian Arthur Schlesinger, Kennedy’s adviser and confidant. As the crisis peaked in late October, Kennedy received a secret letter from Khrushchev offering to end it by simultaneous public withdrawal of Russian missiles from Cuba and US Jupiter missiles from Turkey. The latter were obsolete missiles, already ordered withdrawn by the Kennedy administration because they were being replaced by far more lethal Polaris submarines to be stationed in the Mediterranean. Kennedy’s subjective estimate at that moment was that if he refused the Soviet premier’s offer, there was a 33% to 50% probability of nuclear war – a war that, as President Eisenhower had warned, would have destroyed the northern hemisphere. Kennedy nonetheless refused Khrushchev’s proposal for public withdrawal of the missiles from Cuba and Turkey; only the withdrawal from Cuba could be public, so as to protect the US right to place missiles on Russia’s borders or anywhere else it chose. It is hard to think of a more horrendous decision in history – and for this, he is still highly praised for his cool courage and statesmanship. Ten years later, in the last days of the 1973 Israel-Arab war, Henry Kissinger, then national security adviser to President Nixon, called a nuclear alert. The purpose was to warn the Russians not to interfere with his delicate diplomatic maneuvers designed to ensure an Israeli victory, but of a limited sort so that the US would still be in control of the region unilaterally. And the maneuvers were indeed delicate. The US and Russia had jointly imposed a cease-fire, but Kissinger secretly informed the Israelis that they could ignore it. Hence the need for the nuclear alert to frighten the Russians away. The security of Americans had its usual status. Naturally, these actions caused great alarm in Russia, which, unlike the US, was quite vulnerable and had repeatedly been invaded and virtually destroyed. That led to a major war scare in 1983. Newly released archives reveal that the danger was even more severe than historians had previously assumed. A CIA study entitled “The War Scare Was for Real” concluded that US intelligence may have underestimated Russian concerns and the threat of a Russian preventative nuclear strike. The exercises “almost became a prelude to a preventative nuclear strike,” according to an account in the Journal of Strategic Studies. The security of the population was no more a high priority for Reagan administration planners than for their predecessors. And so it continues to the present, even putting aside the numerous near-catastrophic nuclear accidents that occurred over the years, many reviewed in Eric Schlosser’s chilling studyCommand and Control: Nuclear Weapons, the Damascus Accident, and the Illusion of Safety. In other words, it is hard to contest General Butler’s conclusions. The record of post-Cold War actions and doctrines is hardly reassuring either. Every self-respecting president has to have a doctrine. The Clinton Doctrine was encapsulated in the slogan “multilateral when we can, unilateral when we must.” In congressional testimony, the phrase “when we must” was explained more fully: the US is entitled to resort to “unilateral use of military power” to ensure “uninhibited access to key markets, energy supplies, and strategic resources.” Meanwhile, STRATCOM in the Clinton era produced an important study entitled “Essentials of Post-Cold War Deterrence,” issued well after the Soviet Union had collapsed and Clinton was extending President George H.W. Bush’s program of expanding NATO to the east in violation of promises to Soviet Premier Mikhail Gorbachev – with reverberations to the present. That STRATCOM study was concerned with “the role of nuclear weapons in the post-Cold War era.” A central conclusion: that the US must maintain the right to launch a first strike, even against non-nuclear states. Furthermore, nuclear weapons must always be at the ready because they “cast a shadow over any crisis or conflict.” They were, that is, constantly being used, just as you’re using a gun if you aim but don’t fire one while robbing a store (a point that Daniel Ellsberg has repeatedly stressed). STRATCOM went on to advise that “planners should not be too rational about determining... what the opponent values the most.” Everything should simply be targeted. “[I]t hurts to portray ourselves as too fully rational and cool-headed…That the US may become irrational and vindictive if its vital interests are attacked should be a part of the national persona we project.” It is “beneficial [for our strategic posture] if some elements may appear to be potentially ‘out of control,’” thus posing a constant threat of nuclear attack – a severe violation of the UN Charter, if anyone cares. After Clinton came, of course, George W. Bush, whose broad endorsement of preventative war easily encompassed Japan’s attack in December 1941 on military bases in two US overseas possessions, at a time when Japanese militarists were well aware that B-17 Flying Fortresses were being rushed off assembly lines and deployed to those bases with the intent “to burn out the industrial heart of the Empire with fire-bomb attacks on the teeming bamboo ant heaps of Honshu and Kyushu.” That was how the prewar plans were described by their architect, Air Force General Claire Chennault, with the enthusiastic approval of President Franklin Roosevelt, Secretary of State Cordell Hull, and Army Chief of Staff General George Marshall. Then comes Barack Obama, with pleasant words about working to abolish nuclear weapons – combined with plans to spend $1 trillion on the US nuclear arsenal in the next 30 years, a percentage of the military budget “comparable to spending for procurement of new strategic systems in the 1980s under President Ronald Reagan,” according to a study by the James Martin Center for Nonproliferation Studies at the Monterey Institute of International Studies. Obama hailed the operation but added that it could not be the norm. The reason, he said, was that the risks "were immense." The SEALs might have been "embroiled in an extended firefight." Even though, by luck, that didn’t happen, "the cost to our relationship with Pakistan and the backlash among the Pakistani public over encroachment on their territory was…severe." Let us now add a few details. The SEALs were ordered to fight their way out if apprehended. They would not have been left to their fate if “embroiled in an extended firefight.” The full force of the US military would have been used to extricate them. Pakistan has a powerful, well-trained military, highly protective of state sovereignty. It also has nuclear weapons, and Pakistani specialists are concerned about the possible penetration of their nuclear security system by jihadi elements. It is also no secret that the population has been embittered and radicalized by Washington’s drone terror campaign and other policies. While the SEALs were still in the bin Laden compound, Pakistani Chief of Staff Ashfaq Parvez Kayani was informed of the raid and ordered the military “to confront any unidentified aircraft,” which he assumed would be from India. Meanwhile in Kabul, US war commander General David Petraeus ordered “warplanes to respond” if the Pakistanis “scrambled their fighter jets.” As Obama said, by luck the worst didn’t happen, though it could have been quite ugly. But the risks were faced without noticeable concern. Or subsequent comment. This piece is reposted from TomDispatch.com with that site's permission.